China denied it supports hacking activities and said it is part of global efforts to combat computer security threats Thursday, a day after Google disclosed some of its email users suffered hacking attacks that orginated within the country. 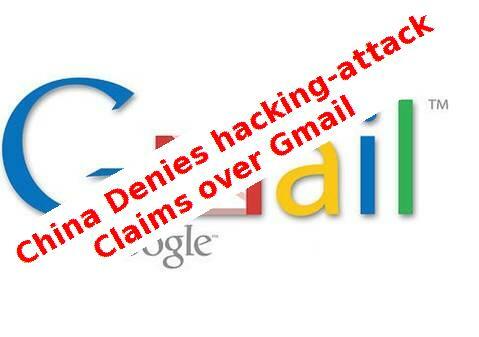 Google disclosed Wednesday that personal Gmail accounts of several hundred people, including senior U.S. government officials, military personnel and political activists, had been breached. Google traced the origin of the attacks to Jinan, China, the home city of a military vocational school whose computers were linked to an assault 17 months ago on Google's systems. China is firmly opposed to activities that sabotage Internet and computer security, including hacking, Foreign Ministry spokesman Hong Lei told reporters Thursday. Hong said hacking was a global problem and Chinese networks had also been targeted by hackers, but he gave no specifics. He said China was working to crack down on the problem, but he didn't respond when asked whether it would investigate this specific incident. "Allegations that the Chinese government supports hacking activities are completely unfounded and made with ulterior motives," Hong said. Google said all of the hacking victims have been notified and their accounts have been secured. This time around, the hackers appeared to rely on tactics commonly used to fool people into believing they are dealing with someone they know or a company that they trust. Once these "phishing" expeditions get the information needed to break into an email account, the access can be used to send messages that dupe other victims. China's Ministry of Industry and Information Technology, which has a hand in regulating the Internet, referred questions about the allegations to another regulatory agency, the State Council Information Office, which asked that questions be faxed and then did not respond. The Pentagon said Thursday it had very little information since the reported breaches involved personal accounts rather than government email. And since the accounts were not official, the U.S. Department of Defense was unaware if the targeted individuals were defense employees, the statement said. The latest attacks aren't believed to be tied to the more sophisticated assault last year. That intrusion targeted the Google's own security systems and triggered a high-profile battle with China's Communist government over online censorship. The tensions escalated amid reports that the Chinese government had at least an indirect hand in the hacking attacks, a possibility that Google didn't rule out. The previous break-in prompted Google to move its Chinese-language search engine off the mainland so it wouldn't have to censor content that the government didn't want the general public to see. The search engine is now based in Hong Kong, which isn't subject to Beijing's censorship rules. China's official Xinhua News Agency blasted Google in an unsigned commentary on Thursday saying the company "provided no solid proof" to support its claims that the hack attacks originated in China. Xinhua said Google's compaints had "become obstacles for enhancing global trust between stakeholders in cyberspace."